One of the challenges of living on the road is locating the freshest food sources. 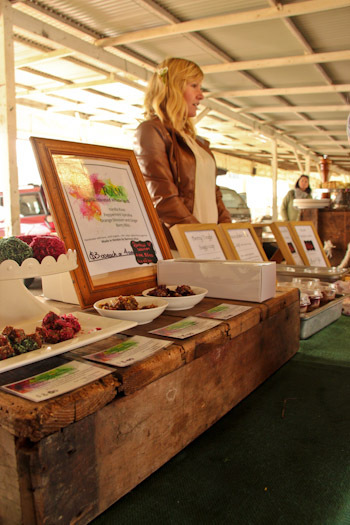 Thankfully, in an area like the Northern Rivers, organic food markets are a regular event. 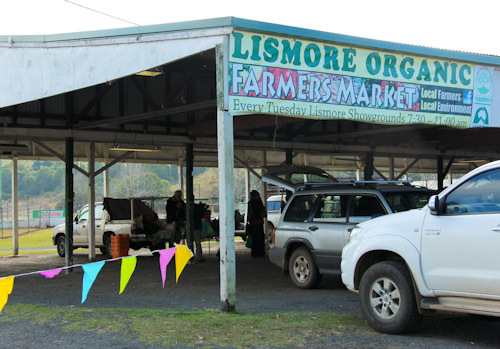 We’ve been enjoying weekly visits to the Tuesday morning Lismore Organic Famers Market at the Lismore showground. It’s an early market — operating from 7.30 to 11.30, which means that we plan our Monday night camping location in proximity so we can be sure to arrive in time for a variety of produce. Today, we arrived relatively late — 10am — which meant that some produce had already been sold out. Most of the produce is laid out on fabric-covered tables. 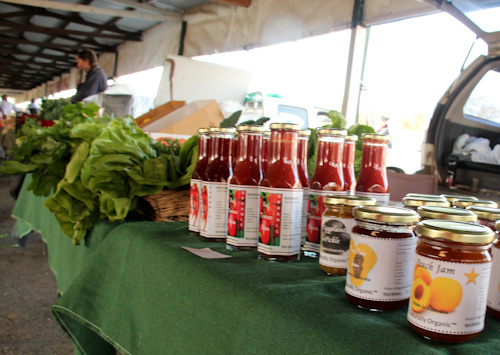 Homemade products are also on offer alongside the vegetables and fruit. 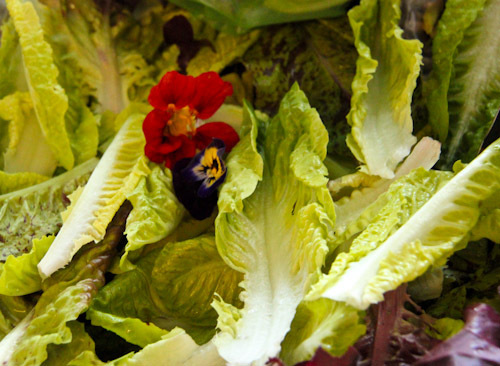 This is the first place that I’ve seen edible flowers for sale as well as the usual collection of salad greens. 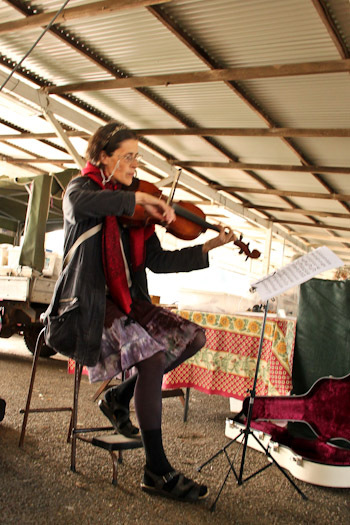 Local musicians add to the happy ambiance and earn a few dollars from the appreciative audience. A couple of fresh meal options are for sale — along with coffee and other hot beverages — and tables in the middle of the shelters give purveyors a chance to sit down and enjoy the fare. Tasters are offered of vegan homemade treats. I love the way that visiting a farmers market allows us to connect with the people who have actually grown the produce. In establishing relationships with the primary producers, we can give direct feedback and talk about what we’re purchasing. 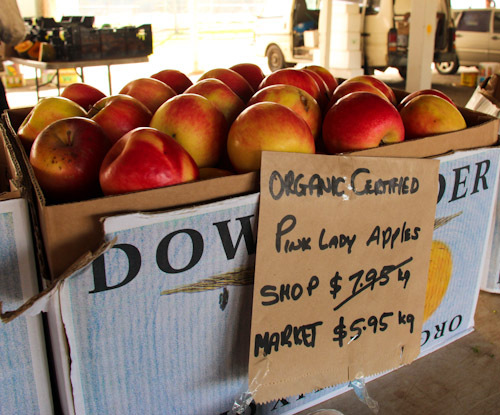 Our favourite buys at the Lismore Organic Farmers Markets have been the macadamia-nut butter and the sweet, organic apples that are sold here for $2/kg less than their price at the Rainbow Food Co-op on Terania Street. 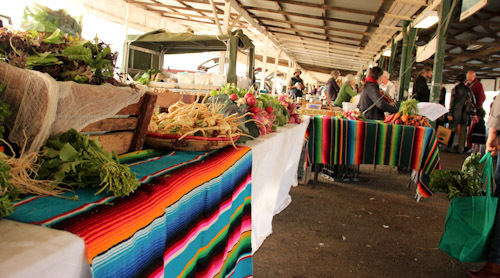 The markets are also a great way to connect with others who value organic produce. Locals sit around chatting, and today we bumped into a local homeschooling family that we’re acquainted with, scoring an invitation to their home for when we finished our chores. I know that if we lived locally, this would be a special place for us to come every week, and while we’re in the area, we’ll keep on stopping by!